and Mayor Muriel Bowser's 202 Creates Initiative | The DC Office of Cable Television, Film, Music and Entertainment. I turn fruits and veggies into liquid and make it taste like magic! With a background in engineering I use logic and nutrition to put together tasty juices with dope names like Green Latifah, Mikale Jackson, & Swizz Beets, which help our customers venture out on flavors they wouldn't normally think twice about. What inspires you about the DC creative community? D.C.'s creative community inspires me to DO more, BE more, and to never stop creating! What's coming up for 2017? I am looking forward to our H St location opening top of the 2017 year and I'm super excited that our Juice Truck will be out full time starting late spring! At the DC Public Library Foundation, Linnea helps to enrich the Library's capabilities by forging community partnerships. 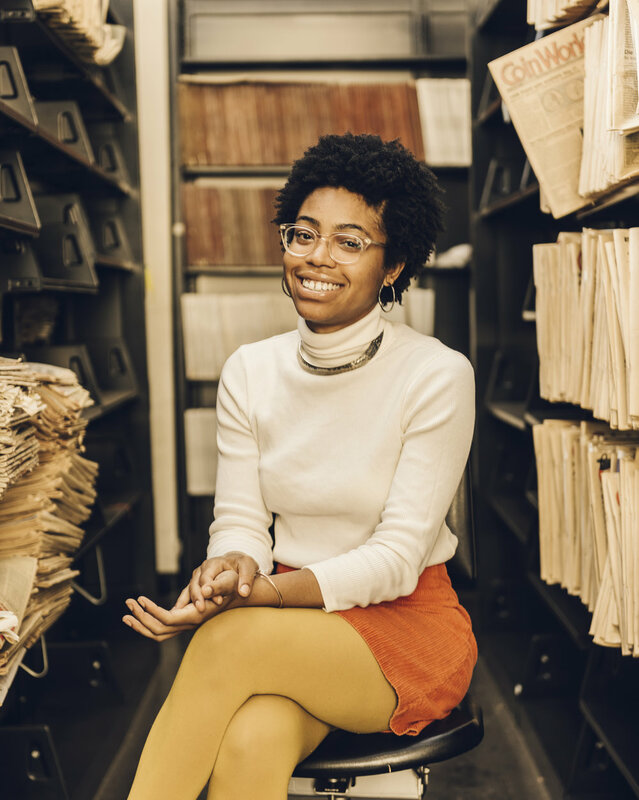 She is a passionate supporter of D.C.'s creative community and believes the Library is one of the most powerful catalysts to make art accessible to all D.C. residents. She's a long-time career fundraiser, and is thrilled to have found her dream job at the Library Foundation, where she's been for five years. What inspires you about the DC creative community? The sense of camaraderie and partnership - that we're all in this together. D.C. is such a fascinating place, with so much potential - it's so great to see everyone working together to realize it! What's up for 2017? The DC Public Library's central location, the MLK Library, will be closing in spring 2017 for a three-year long modernization project, and we think the opportunities are endless to better serve, promote and support the creative community there and in our 25 neighborhood libraries. Beau Young Prince is a Washington, DC rapper, singer/songwriter, and producer known for his solo work, as well as his electronic hip hop duo, Young Futura. Combining modern hip-hop and future bass music, Beau Young Prince is proving to be unstoppable by pioneering a fresh sound from DC with eccentric and unique lyricism and multi-genre production. What inspires you about the DC creative community? The city is so fresh in terms of building the interior structure of the creative community, and because of this I am inspired to be one of the people creating stepping stones for us to be a major hub for arts, music, and culture at large. There is so much hustle in DC. We have a plethora of talent and a unique style. I am inspired by all the things that make up the DNA of DC. And what's up next / for 2017? I am most excited about releasing more solo and group projects. Look out for the Young Futura 'Patience' EP and a solo EP 'Velour Sweatsuit' coming in 2017. Thank You! Nakeya Brown was born in Santa Maria, California in 1988. She received her BA in Visual Arts and Journalism & Media Studies from Rutgers University and her Masters of Fine Art from The George Washington University. Her photography has been exhibited at the McKenna Museum of African American Art, Woman Made Gallery, Vivid Solutions Gallery, and Transformer Gallery. What inspires you about the DC creative community? It's helped me to build sincere friendships with other artists and curators that are challenging the politics of identity. The creative community of DC brought me here and the creative community keeps me here. 2017 plans? In January I'll be mounting a photography show at Hamiltonian Gallery entitled "Some Assembly Required". Making it cool to live healthy. Broccoli City is a social enterprise that roots itself in a triple bottom line strategy that focuses on people, planet, and profit. Broccoli City is building thriving urban communities that sustain future generations by mobilizing and educating urban millennials through social impact campaigns and major events. What inspires you about the DC creative community? [We're] Inspired by each other and being able to be around so many people who are doing things outside of the box and pushing away from the normal and traditional. It's cool to be a part of this energy. 2017? We are really excited to introduce Broccoli City Week, a 3 day curated selection of events and a conference, that brings the world of Broccoli City to life and culminates with Broccoli City Festival V.
Victor Benitez, Maryann James-Daley, Russell Martin, Esti Brennan, Casey Danielson, Adam Schaeffer, and William Reid. The Fab Lab is a Do-It-Yourself space within the DC Public Library that allows patrons to learn, make and collaborate. "When robots break in the FabLab, I fix them! I'll teach you how to fix them, too!" What inspires you about the DC creative community? Creative people here come from many different places and their creative ideas reflect their diverse backgrounds! And what are you excited about, re: 2017? I am really excited to start our tool lending library next year! DC based Artist/Creative Mammal - I love making people smile. High Fives. What's inspiring you lately, re: DC creative community? The fact that DC Creatives are really coming into their own - defining what it is to be a DC artist in whatever field we are in. Game on. "Officially, Director - Unofficially, Chief Advocate for Small Biz"
I have always minded my own business! From Small Business Owner --> President of the Greater Washington Hispanic Chamber of Commerce --> Assistant Administrator of SBA under President Obama --> Director of Dep. of Small and Local Business Development under Mayor Bowser. What inspires you about the DC creative community? Their constant innovation, unending creativity, fearless attitude and absolute pride in our city. And what are you looking forward to in 2017? Making DSLBD more responsive to our creatives and makers. Seeing the "Made in DC" brand pop up on more and more products and in more places. Washington, DC is much more than the nation’s capital. We’re on a mission to tell visitors (and remind locals) that this city has everything, from food and culture adventures, pop-up shops to Michelin-rated dining and exciting neighborhoods. We highlight amazing DC experiences for our audiences via the #MyDCcool hashtag. What inspires your team, re: DC creative community? There’s always something creative going on in DC, so we try to share as much as we can with event-seekers on washington.org. On the 2017 to-do list? We have a big opportunity to welcome the most important international trade show in America called IPW. Through hosting IPW, our goal is to welcome increased visitors (international and domestic) to experience what so many locals already know, that DC is its own vibrant, unique community worth exploring. Our stretch goal: To get every visitor riding the Metro to stand on the right side of the escalator. Conveners of DC's incredible creative community. DC's community and breakfast lecture series for creative types, hosting monthly events featuring creative talents in inspiring places (and lots of coffee). What inspires your team about DC's creative community? DC rarely has gotten credit for being a place of creative vision, but this is finally changing. We love seeing DC's creative community finally beginning to get its due and are proud to help gather and provide a platform for inspiration, connections, cross-pollination, and collaboration. 2017? The team at CreativeMornings/DC is looking forward to another great year of inspiration and community as we explore DC's creative places and points-of-view. We will see you there bright and early (it's worth getting up for—we promise)! I’m a creative busybody with a background in contemporary performance/dance. Now I’m building a park. I’m currently obsessed with learning all about biking in the District – it’s the focus of our Anacostia River Festival in 2017. I gotta get a bike by April! What inspires you, re: DC creative community? East of the River artists are resilient, truth-telling, civically-engaged friends. I’m working to keep them at the center of neighborhood dialogue and our programming. Looking ahead to 2017 - what's in the works? We want residents and artists who live east of the river to stay here. That’s what the Bridge Park’s Equitable Development Plan is all about. In 2017, my goal is to make sure that artists’ voices are more cohesively folded into the Plan. Also, my husband and I bought our first home and I am pumped about decorating and making it mine! Victoria Reis is a curator, cultural producer, arts organizer, and artist advocate. What inspires you about the DC creative community? As the nation's capital, DC has an ever evolving local creative community that can readily engage national and international collaborators and supporters. Looking ahead - 2017? I'm especially excited to be working with DC & Baltimore based artists on a summer collaboration at the Hirshhorn, and to be hosting projects by national colleagues in the Common Field network at Transformer. Mark G. Meadows is a jazz pianist, vocalist, and actor who uses his gifts, experiences, and passion to create a unifying sound that breaks through social barriers. Through lyrics, harmony, and improvisation, his message is simple: to bring love, peace, and understanding to the people. What about the DC creative community inspires you? DC is on the forefront of change. We all seem to be on the "same page". We just need a platform to spread this art, this passion, this message, throughout the country and throughout the world. 2017 plans? Looking forward to collaborating with artists from different genres and different art forms. + Justin T. Gellerson, Tiffany Meehan, Pammy Carroll, Nicole Capo, Valerie Newton, Craig Cassey, and Jes Shields.